Moongil Thottam from Kadal could take you on a satiny musical trip and the man who is responsible for taking audience on this heavenly trip is Abhay Jodhpurkar. Hailing from Madhya Pradesh, the young singer has made Chennai his abode and has been making waves in the music circuit. In conversation with Senior Editor Jyothsna Bhavanishankar, Abhay tracks his musical journey from Madhya Pradesh to Chennai to A R Rahman. 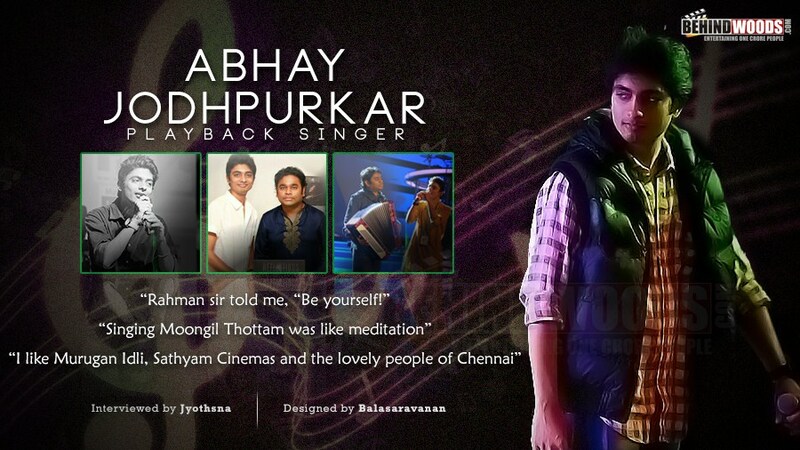 Over to Abhay Jodhpurkar…. I am basically from a small town called Sendhwa (District- Barwani) in Madhya Pradesh, born in a middle-class family with a rich heritage of Indian Classical Music. I have always been passionate about Arts, Music, Dance and Sports, but was confused about what to pursue in my career. As I grew up learning and listening to music I eventually realized that I was most passionate about music. I used to win many music competitions but couldn’t concentrate on learning it as I was more focused on studies. After coming to Chennai, things changed and here I am! What brought you to Chennai? I was merit-listed in SRM University’s entrance exam, I got enrolled for a B Tech Course in Bio-Technology and that’s what brought me here. Were you musically inclined from your early years? Who are your gurus? Yes, right from my childhood! My grandfather Hanumant Rao Jodhpurkar and Ms. Sulochna Moghe were the most important teachers in my life who not just taught me music but also inspired me to become a good human being. After coming to Chennai, Mr Kuldeep Sagar sir and Mr. Munna Shaukat Ali sir taught me Hindustani Classical and Qawwali respectively. How did you get into A R Rahman’s fold? I came across KM Music Conservatory in my 2nd Year of B Tech and I joined it right away as I anyhow wanted to be associated with music and Rahman Sir being the principal of the institute made me all the more excited to be a part of it! When it is a dream for singers to sing for ARR, how did you feel when you got the opportunity to sing for him? It was a dream come true! Those moments were the best moments of my life that I will always cherish! I feel I am lucky and gifted to have had the opportunity! How did Moongil Thottam happen? Right after Rahman sir spotted me singing a Qawwali line at an annual performance day of KM, he started calling me for Kalaams (Sufi devotional songs). During a recording he heard me sing and was very impressed and that's when he gave me Moongil Thottam. Singing Moongil Thottam was like meditation. Rahman sir was instructing me how to sing and I kept on singing. Within 45 minutes the recording was done and I couldn’t believe it was me who sang it! He extracted the best out of me and I figured what potential I had and how good I was capable of singing. Did you anticipate that the song will become a great hit? I didn’t even know it was a final recording, I thought it was a scratch but he retained it! I was sure that the song was going to be a massive hit but didn’t know I would still be a part of it; it was the biggest surprise of my life. I thought Moongil Thottam was a scratch but Rahman retained it! What are the tips that ARR gave before Moongil Thottam? He just wanted me to be myself and to have my own approach and texture to the song. I still remember his words- “look at yourself in the mirror; you cannot copy others and succeed; you are unique; evolve yourself and come up with something that world has never heard before”. These words will always echo in my mind. How do you manage singing Tamil lyrics? What are the preparations you undertake before singing Tamil lines? Ever since I came to Chennai, I started listening to Tamil songs and listening to them for 3-4 years has helped me get the diction right. Knowing the meaning of the words helps me impart more feel to the song. I always make sure that I correctly pronounce the words I have been given and try to do justice to it. It was great working with all of them, but I loved working with Imman sir the most as he is very open to welcoming your ideas, he would let you improvise, have your own color and texture to the song and that freedom is what makes the song best from a singer’s point of view as well as from his vision. What is your personal favorite in terms of singing- melody/fast paced/kuthu numbers? Melody because melodies have more life, they will stay forever unlike most commercial hit numbers these days, though I also love singing fast paced/kuthu numbers. I would love to explore all possible genres of music. In your opinion, what is the USP of your voice? I am yet to figure that out! Shreya Ghoshal, Hariharan, Shankar Mahadevan, SPB and Yesudas. I have to learn so much! I consider myself an average singer considering the amazing vocalists our country has. How is Chennai treating you? Chennai has been really sweet and heart-warming to me! What do you like about Chennai? Carnatic Music, Bharatnatyam, Marina Beach, Murugan Idli, Sathyam Cinemas and the lovely people!